The Publisher Says: Laos, 1975. The Communist Pathet Lao has taken over this former French colony. Dr. Siri Paiboun, a 72-year-old Paris-trained doctor, is appointed national coroner. Although he has no training for the job, there is no one else; the rest of the educated class has fled. He is expected to come up with the answers the party wants. But crafty and charming Dr. Siri is immune to bureaucratic pressure. At his age, he reasons, what can they do to him? And he knows he cannot fail the dead who come into his care without risk of incurring their boundless displeasure. Eternity could be a long time to have the spirits mad at you. My Review: In the Vientiane, Laos, of November 1976, green-eyed Dr. Siri Paiboun is the seventy-two-year-old coroner...the only one in the newly liberated by communism country...charged with discovering why Mrs. Nitnoy, powerful leader of the Laos Women's Union and wife of Member of Parliament Kham, suddenly keeled over dead. Her husband insists it was her peasant taste for raw pork. The judge Dr. Siri works for thinks that sounds reasonable, and also unnecessary to investigate. Dr. Siri knows otherwise. Not because he's that good a coroner, since he's only had the job for ten reluctant months...he knows because Mrs. Nitnoy told him so. So begins a fascinating look into the chaotic world of Southeast Asia in the wake of the Vietnam War, told from the out-of-the-Anglophone-ordinary viewpoint of the Southeast Asians left to pick up the pieces. The story follows Dr. Siri as he is manipulated from behind the scenes in someone's quest to hide truths from the doctor, someone who clearly doesn't know...heck, even the good doctor doesn't know!...that Dr. Siri is the latest incarnation of legendary thousand-plus-year-old shaman Yeh Ming, and so has the ability to see spirits and call on ancient energies intrinsic to Laos's beautiful forested mountains. 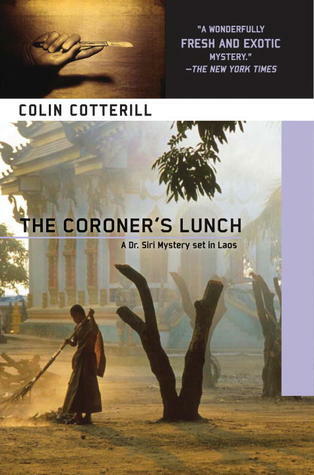 Dr. Siri is called upon to use his increasing skills as a coroner to look into the deaths of three Vietnamese nationals, in Laos for purposes both secret and unknown to anyone Siri knows; then is sent to the ethnically Hmong south to deal with the sudden and unexpected deaths of Army officers in charge of an economic revitalization program that doesn't seem to be revitalizing so much as devitalizing the men in charge; and while among the Hmong, who worryingly seem to know him better than he knows himself, Siri finally gets to know Yeh Ming, his fellow traveler in this green-eyed body in a country of brown-eyed people. With a combination of mundane detective skills, spirit guidance, and help from a formidable nurse, an eidetic Down's syndrome laborer, an old friend in high places, and a new friend in clandestine ones, Siri ties all the malefactors in knots and delivers them to the proper authorities (whether spiritual or mundane) with ribbons on. This book is such a welcome addition to my series-mystery-loving world. Dr. Siri is a delight. He's too old, and too weary, and too smart to be scared by petty bureaucratic thuggery. He values his comfort...oh yeah baby, the older we get, the more we do!...but his idea of comfort includes doing the real right thing, not the easy right thing. Cotterill gives Dr. Siri a deep and rich backstory reaching into Laos's colonial French past, extending into the jungles of Pathet Lao communist resistance, and through to the time of victory and the inevitable Animal Farm-esque disillusion that accompanies regime change. "Throw the crooks out!" the cry goes up, but the unsaid and often unrealized second part of that cry is, "and let our crooks have a turn!" Dr. Siri sees this, knows it, and frankly doesn't care. He's got no children, so no grandchildren, and so no, or a very small, stake in this Brave New World. Except, well, you know, there IS justice in the world, imperfect and piecemeal though it may be, but justice demands a good man's best be given and a heavy price be paid both for administering and evading it. He might only have one (metaphorical) eye, but Siri is honor bound to use it among the blind he lives with. It's this quality that makes him irresistible, and gives Cotterill's creation a semblance of life that brings him out of the pages of the book and into the imagination of the reader who lives in a world where ideals of fairness and decency and selflessness have degenerated into "don't tread on me" selfishness and mock-"liberty" that curiously resembles "don't tell me what I can do with what's mine" greed. It's these very things that Siri grimaces at.